When I had to buy a new step for the step aerobics I do at home, I noticed there was a new product at the sport’s store: a slanted step. I wondered how the slanted step differed from the flat one, so I figured I would buy it and see. I had a difficult time getting used to the slant. I constantly looked down at my feet to ensure I wasn’t about to fall off. And I was more careful doing the aerobic moves that used to be so easy for me. I felt like I was balancing more, and the full length of my foot never seemed to touch the step. I was always on the balls of my feet! Afterwards, I was exhausted and sweaty, so I knew the work out was a success. However, little did I know just how sore my calves would be the next day—and the following several days thereafter! I could barely walk the next morning. A small touch or rub to my calves caused me to yelp in pain. I’ve done step aerobics all my adult life and never had I been so sore! The worse part was that I had a writing deadline, so I didn’t work out for the next three days. I kept hoping each morning that my calves would feel less tense, but they became stiffer. As I sat on the computer for hours a day, I knew my stagnant legs muscles were getting clogged with lactic acid. I needed to get up and work them out! Finally, on the fourth day after my slanted step adventure, I got on my treadmill and ran. Each step hurt at first; but after a while, the tension building up finally began to release. The next morning my calf muscles felt so much better. This story reminds me that when we are emotional or spiritually tense, sore or upset, the last thing we need to do is fall into a stagnating hole of depression and self-pity. We need to get up and run to God! 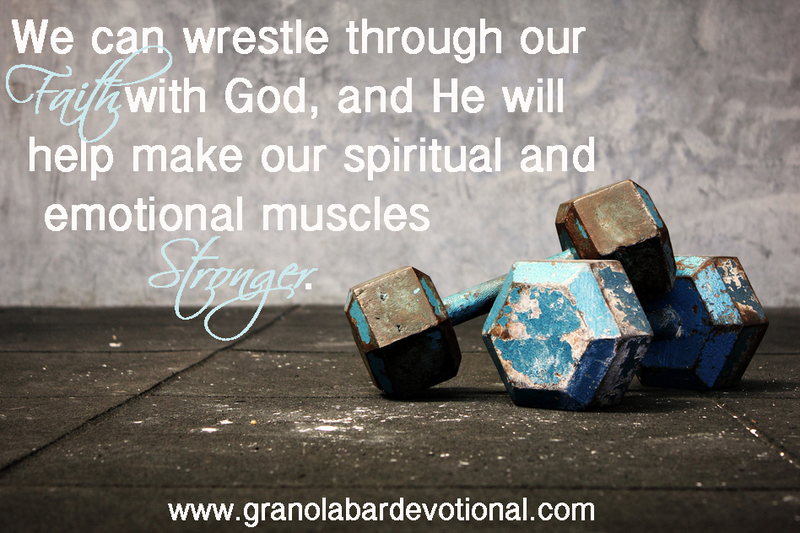 We can wrestle through our faith with God, and He will help make our spiritual and emotional muscles stronger. Yes, the process hurts a little bit. Yes, the first steps are the hardest to take. But we can’t let the acid of the Enemy build up in our lives, causing damage to our hearts and minds. Freedom and joy await us at the end of our struggle if we are willing to work through the pain with God and His Spirit! Thank you, Angie! Would love to have a devotional from you too! Just paste it to the “Contribute Devo” Page, and we’ll make sure to find it a beautiful home on our site!